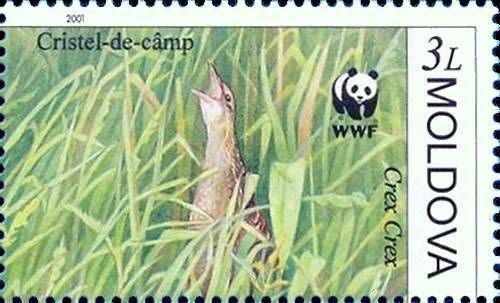 On 31 March 2001, the Post Office of Moldova (Poșta Moldovei) issued a series of postage stamps with the title Protected Fauna - Corncrake. World Wide Fund for Nature (WWF). The issue comprises four stamps, with associated cancellation (postmark) and first day cover (FDC). The designer was Elena Karacenţev. The printing was performed by Bundesdruckerei, Germany. This article uses material from the Wikipedia article 'World_Wide_Fund_for_Nature', which is released under the Creative Commons Attribution-Share-Alike License 3.0. 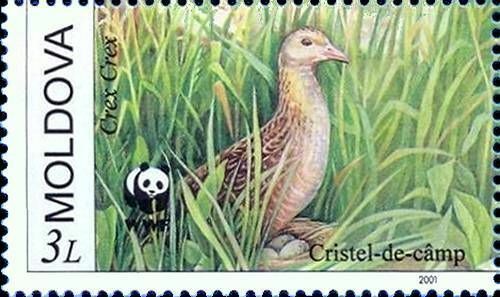 The Corn Crake, Corncrake or Landrail (Crex crex) is a bird in the rail family. It breeds in Europe and Asia as far east as western China, and migrates to Africa for the northern hemisphere's winter. It is a medium-sized crake with buff- or grey-streaked brownish-black upperparts, chestnut markings on the wings, and blue-grey underparts with rust-coloured and white bars on the flanks and undertail. The strong bill is flesh-toned, the iris is pale brown, and the legs and feet are pale grey. The juvenile is similar in plumage to the adult, and the downy chicks are black, as with all rails. There are no subspecies, although individuals from the east of the breeding range tend to be slightly paler than their western counterparts. The male's call is a loud krek krek, from which the scientific name is derived. 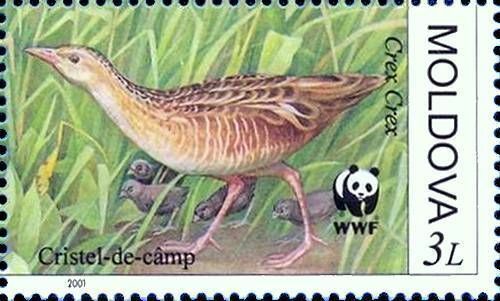 The Corn Crake is larger than its closest relative, the African Crake, which shares its wintering range; that species is also darker-plumaged, and has a plainer face. Read more.. 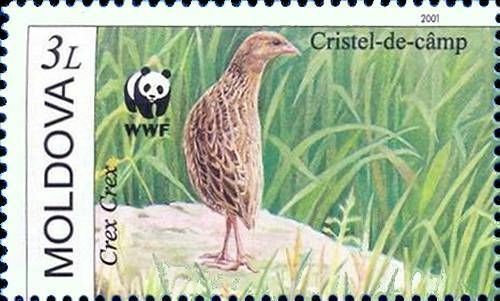 This article uses material from the Wikipedia article 'Corncrake', which is released under the Creative Commons Attribution-Share-Alike License 3.0.